Illinois taxpayers will be forced to contribute $320 million extra to the State Employees’ Retirement System, or SERS, in 2018 due to changes the fund is making to its overly aggressive assumptions. SERS is lowering how much it predicts its investments will earn in the stock market (to 7 percent from 7.25 percent) as well as revising how long it expects retirees to live along with other actuarial changes. The state pension fund’s changes were announced only a few days after Chicagoans received bad news of their own. Chicago’s June 30 financial report showed the city’s total debt jumped by over $17 billion, growing to nearly $24 billion in 2015. SERS’s changes will make a significant difference in the system’s funding ratio, debt and taxpayer contributions. In 2016, the system’s funding ratio will fall to less than 35 percent from 37.5 percent, and its pension debt will grow by nearly $5 billion to a total of over $30 billion. For Illinois taxpayers, a bigger debt means even bigger bailouts. By 2018, Illinoisans will have to contribute an extra $320 million a year ($2.38 billion a year, up from $2.06 billion) to the pension fund compared to projected funding obligations before SERS made these changes. Most Illinoisans know the pension crisis is severe and has been growing for years. 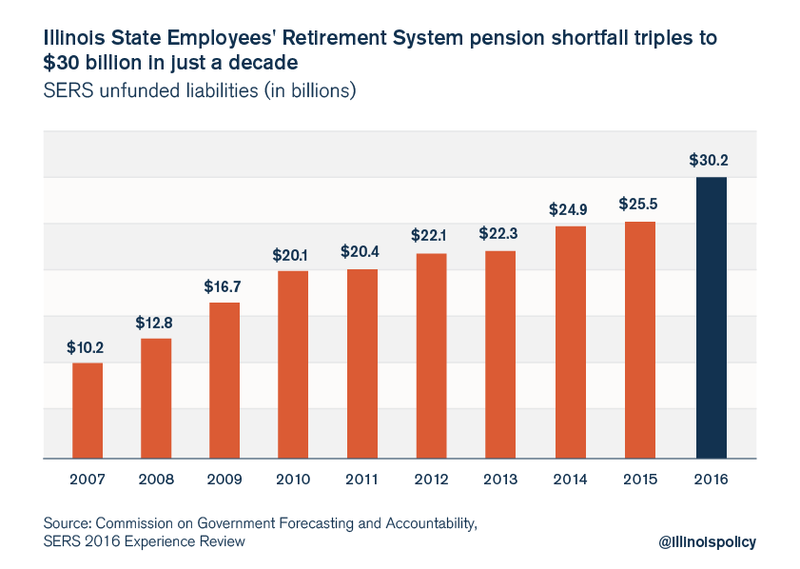 But what most Illinoisans don’t know is that the state’s government-worker pension funds continue to use rosy, overly optimistic assumptions hiding just how close the systems are to total insolvency. SERS’s changes are only a tiny step toward more realistic reporting about the extent of the crisis. Financial institutions such as Moody’s Investors Service have recommend for years that pension funds should assume they will receive lower, more typical stock market returns of 3 to 4 percent. Under Moody’s recommended standards, Illinois’ total $111 billion pension debt doubles. The more realistic Illinois pension funds become in their financial calculations, the more obvious it will become that the pension system is entirely broken and beyond saving. Illinois needs to move away from its broken pension systems – starting by moving new government workers to 401(k)-style plans and giving existing workers the option to have their own self-managed accounts. Doing that, in addition to enacting a constitutional amendment allowing Illinois to reform the unearned pension benefits of current workers going forward, is a crucial first step in fixing Illinois’ government-worker pensions.